This is not going to be your typical page on Levaquin Tendonitis Treatment. If you are simply doing a report on Levaquin Tendonitis or you are looking for traditional medical treatments, good luck. A search for Levaquin Tendonitis brings up mostly lawyers offering to represent you in a lawsuit or forums like The People's Pharmacy with people who are disabled discussing their pain and weakness that has not improved for many years despite all the Levaquin Tendonitis Treatment. Good luck if you are going to stick with Traditional Medicine for your problem- and please let us know if you had a Levaquin Tendonitis Treatment that was actually effective and helped you to get better. We absolutely want to hear about that. But if you HAVE Levaquin Tendonitis and have not been able to get better, you are in a good place to start. Levaquin Tendonitis is a rare but often completely disabling 'side effect' of the antibiotic Levaquin and any of its associated antibiotics known as 'Fluoroquinolones'. There is no cure for Levaquin Tendonitis or related Levaquin damage known to the medical world. But their IS a Levaquin Tendonitis Solution!! What if doctors and researchers are looking for Levaquin Tendonitis Treatment in drugs that don't exist yet when they SHOULD be looking for answers in YOUR body? With the help of Kerri Knox from www.Easy-Immune-Health.com and extensive testing on real life people with Levaquin Tendonitis and Levaquin Toxicity, we have put together a step-by-step plan to help you overcome your pain and other symptoms of toxicity- at their SOURCE. I'm big on the physical side of the Tendonitis and Tendonosis dynamic. Kerri is a long time ER/ICU nurse, and a Functional Medicine practitioner, and she's big on the medical knowledge, systemic workings, and up to date research. There is a LOT of information that could make for an effective Levaquin Tendonitis Treatment for you- so keep reading and bear with me while while I go over the MANY factors and problems that are clues to why you are hurting AND how knowing more about these problems just very well COULD be of help to you. First. A very important question to ask is, 'Why do some people get damage from Levaquin while others people don't, and why do others heal after this damage while others don't'? Not everyone gets damage after fluoroquinolones, and we are basing this page on the fact that everyone has individual metabolic and cellular processes going on in their body that may have predisposed them to getting Levaquin Tendonitis in the first place. It's not -just- because the quinolone family of antibiotics is toxic, but that there is some individual factor in YOU predisposing you to damage from the toxin! If it was just a factor of toxicity or poison, everyone would be affected, right? So, there MUST BE other factors at play; variables that make someone more susceptible or vulnerable to the toxic aspects of these antibiotics. Read each section carefully and thoroughly. No one has presented this information about Levaquin Tendonitis Treatment quite like this before, and if you are truly interested in helping your body to heal, then you will want to read each and every section as a small pearl of wisdom that just very well COULD help you. In addition, these problems not only PREDISPOSE you to Levaquin Tendonitis, but that these same deficiencies could very well offer you a possible Levaquin Tendonitis Treatment- not based on drugs, but based on improving the underlying metabolic problems that caused your problems in the first place. So, let's start to tease all the pieces of our Levaquin Tendonitis Solution and then see how they all work together. While most people consistently tell us that they were 'healthy' before they got Levaquin Tendonitis and that they couldn't possibly have any nutrient deficiencies, specialized testing of people with Levaquin damage tells a different story. The VAST majority of people with these chronic problems were either nutrient deficient BEFORE they were poisoned, or became nutrient deficient afterwards which keeps them from healing. In both cases, nutrient deficiencies were one of the predisposing factors or they are keeping you from healing. Tendonosis is a function of not enough circulation to the tendon cells, which then essentially starve and die. This tendon tissue degradation doesn't necessarily feel painful to us. Levaquin attacks the fibroblasts in our tendons. If we already have tendon structure degradation, a sudden influx of fibroblast destroying cytotoxin can lead to sudden and enhanced tendon degradation, whereas someone with 100% healthy tendons my either take no damage, or hurt for a time and then heal. The body is constantly detoxifying, and those who aren't able to have a BIG problem. While we are not going to go into detail on the complicated processes involved, an ineffective or inefficient ability to mobilize nutrients into at least of the two detoxification 'pathways' is almost certainly a problem for you and MUST be fixed before you are ever going to heal. As a nation we have unhealthy, insufficient levels of many nutrients- even those who eat 'PERFECT' still eat food grown in nutrient poor soil or that are picked too early. And some people simply have much higher genetic requirements for some of these nutrients in the first place. Add in a constant massive dose of toxins in the environment that must be detoxified every day that already uses up these precious substances, most of us have a limited ability to detoxify any more chemicals. So, if you are on the edge of being low in nutrients required to detoxify substances- even if you think that you are 'perfectly healthy' (and lets face it, if you needed Levaquin in the first place, then you weren't perfectly healthy now were you!? ), if you add in a big dose of a chemical like Levaquin that must be detoxified then you could have easily set up a chain reaction of cellular damage from toxins floating around in your body. People that get sudden muscle pain from Levaquin possibly already had 'low energy' at a cellular level. Mitochondria are the tiny cellular energy centers at the center of every cell. They are most well known for containing the 'Mitochondrial DNA' that transfers from the mother to every child. In any case, your mitochondria do SO much more than carry DNA. Every cell creates energy to give YOU energy- and the mitochondria are DIRECTLY responsible for this. Due to diet, genetics, increased amount of toxins in the environment, inability to detoxify, advancing age, etc, some people may already have 'low cellular energy' or even an underlying mild genetic mitochondrial disorder that didn't show up until you took the Levaquin. In fact, this may be one of the same reasons that some people tend to get Statin Muscle Pain where the muscles become weak, painful and sometimes even damaged so badly that they get a life threatening muscle wasting condition called Rhabdomyolysis! That's how important the mitochondria are! 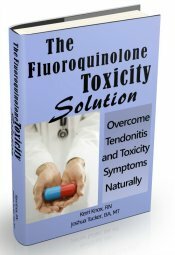 If you are a person that already has, or is prone to, low mitochondrial energy levels, then dumping Floroquinolone cytoxicity into the system can knock it down or wipe it out, depending on your exact situation. And just like with the Cholesterol Lowering Statin drugs, if you have strong, healthy levels of nutrients and mitochondrial energy, you may be better able to resist the effects of these drugs. Nearly everyone who has Levaquin Tendonitis has some degree of Inflammation. And Inflammation is another one that probably plays more a role in post-Levaquin damage the puts one at risk for it, but since nobody knows, and we need to lower inflammation levels anyway because that will lower pain levels, it is important to take into account. It's also important to get as educated as possible. Learn with the free 7 Day E-Course, sign up below. As described above, there are many individual biochemical factors right there in YOUR body that may be affecting YOUR ability to heal. Just for the record. We are not doctors, we are only educating- not treating. But we have not seen a Levaquin Tendonitis Treatment that actually works and we believe that correcting these imbalances can help you to heal- and healing your own body is the most effective Levaquin Tendonitis Treatment that there is. If you want to wait until there is an AMA approved Levaquin Tendonitis Treatment drug or procedure- you are going to wait a LONG time for double blind placebo controlled long term studies to be done and drugs to be approved, etc. In the meantime, you can fix the factors IN YOUR OWN BODY that may be contributing to the problems or preventing your own body from healing. Does that make sense? If it does, then here is what I suggest. If you are one of those with temporary damage, the right physical things like Physical Therapy and icing may work. But with the knowledge you get from the Levaquin Tendonitis Solution, those of you who haven't been able to get better just might have some hope again. If you are one of those with permanent, and disabling damage, Levaquin and Cipro cause system damage that just doesn't go away. Something is wrong with YOUR system, and fixing THAT is likely to be the only Levaquin Tendonitis Treatment that you are going to find! Return to the top of this Levaquin Tendonitis Treatment page. Go to the main Levaquin page. Go to the main Tendonitis page. Go to the TendonitisExpert.com homepage.